The best screen recorder for you to capture Windows 7. If you are a Windows 7 user, you may be disappointed because there is no built-in screen recording tool available to capture your desktop screen activity, webinar or gameplay. Since there are so many screen recorders available for Windows, it is hare and time consuming to choose the right one based on your needs. If you are looking for an easy-to-use screen recording software for Windows 7 yet providing both screen recording and video editing features with high quality (even for 4k recording), then Filmora scrn Screen Recorder Software is one of your best choices. The instructions below will introduce about how to record your video, audio as well as the webcam on your Windows 7 in details. Just download the screen recording software first and follow the steps to record your own screen video on Windows 7. Filmora scrn is an excellent screen recorder for windows 7. Simple yet efficient. It is good for videos, tutorials, reviews, walkthroughs, game plays and whatever you might be planning. So what basically sets it apart from the rest? Let’s dig a little bit deep. First install Filmora scrn. After installation, clicking application will open a window with 3 options. Quick Capture, Video Editor and Get Started. Get Started to customise settings properly as per what you are recording on Windows 7 and what settings suit that. There are 4 tabs on the left side. Screen capture: To set full recording screen on Windows 7 or some portion for recording. Also select Frame rate between 15 to 120fps. Audio: Enable for recording audio inputs. There are setting options to control how to record computer audio and the microphone. Camera and Advanced (optional): Setting options include camera selection, resolution and frame rate. You also can customise Hot keys for Start/Stop recording screen for Windows 7, Pause/Resume and full screen recording, and set where you want to save file. After finishing this click "Capture" to get started. Recording panel will open with recording button, pause button, timer and showing the microphone, webcam and desktop audio settings. These settings could be enabled or disabled through checkboxes. Clicking button will start recording screen for Windows 7 after countdown. After recording is finished it will load into the editor. 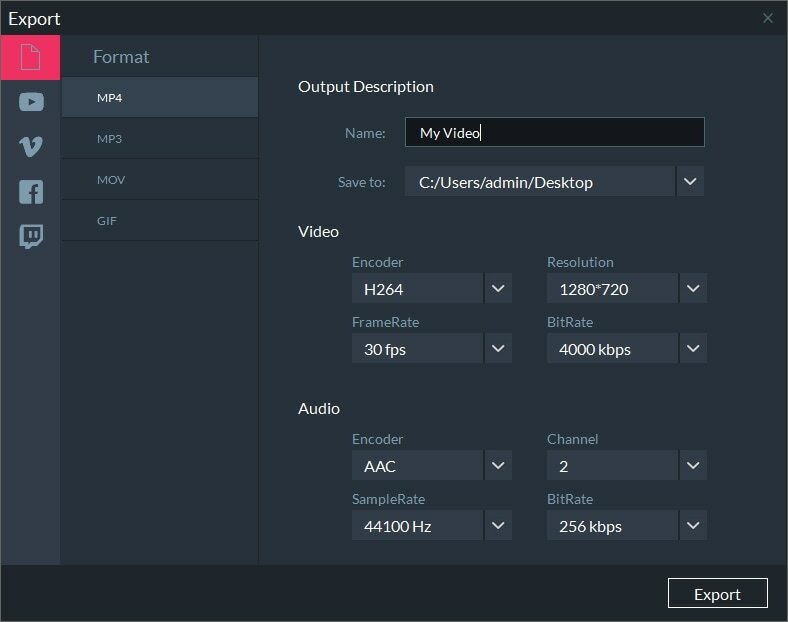 An editor window will open with all the recorded clips. You can export recordings (all or selected ones) into the editor or to local destination folder. Cursor: You can adjust cursor appearance, opacity and scale of visibility. You can highlight cursor, set left click rings options or adjust left click sound. Annotation: Text, effects or explanations etc can be added. Annotations can be customised for text size, colour and font etc. Different types of effects are also available at website which can be used. Just add the effects where you want to add on the timeline and the duration for which you want to add it. After editing click the export button to create video. It can be saved as MP4, MP3, MOV, GIF. Do final settings about destination folder, name and encoding/decoding etc. and you are done. The software is available for free trail whereas if you prefer to buy it then it will only cost you $24.99 for lifetime license. Simultaneous 2 device recording: Webcam and screen recordings at the same time. This enables the inevitable Picture in picture feature especially for game plays. Frame rate customisation: Select between 15 to 120 fps as per need and the device speed. For game plays the option of 120fps is great especially for fast paced games. Import and export file options: Compatible formats of around 50 and more audio, video, music and media file extensions to import which is an added plus to make final product look professional. Recording window customisation: Full screen or some part of it. Annotations: Text or graphics for learning or explanation purposes. Similarly circles and arrows could be drawn to draw attention. Great effect tools are present. What makes Filmora scrn a stronger candidate to consider is its excellent design, efficient tools, simple editing and great set of features, including 120 fps and PIP setting. What's more, you also can record screen for windows 7. So if you are a window 7 user and want to make a tutorial, skip the hair pulling frustration, and jump right at downloading Filmora scrn which no doubt is the best screen recorder for windows 7.